Just recently McDonald's Japan revealed that a new Pokemon McFlurry would to be released in celebration of the 20th Pokemon movie, Pokemon the Movie: I Choose You!. At the time several potential flavors were revealed: Pikachu Chocolate-Covered Banana, Bulbasaur Broccoli, Charmander Habanero, Squirtle Ramune, Jigglypuff Peach, and Gengar Purple Potato. As tasty as a Bulbasaur Broccoli McFlurry sounds, we all knew that series mascot Pikachu would eventually stand above the rest. Sure enough, a few days later Pikachu's flavor was chosen. So it is that I find myself partaking in a Pikachu Choco-Banana McFlurry for your insatiable curiosity. 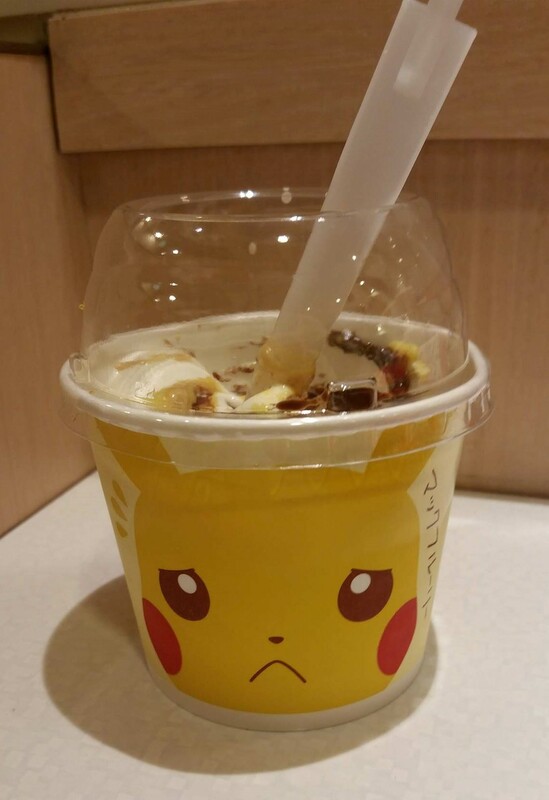 The Pikachu Choco-Banana McFlurry comes in a collectable cup adorned with the face of the titular electric mouse. However, I use the term "collectable" in the loosest form possible. While it's true there are 6 unique cups in all, they're the same low quality paper cups as you'll find with any McFlurry. I don't know about you, but I didn't enjoy the prospect of carrying a sticky, melted ice cream filled paper cup with me on the train home. Had they been plastic I might have gone to the trouble of washing it out in the bathroom and have had a nice souvenir to bring home. My advice: Just have fun guessing which Pikachu face you'll get and throw the cup away when you're done eating. I got the sad Pikachu cup myself. I hoped this wasn't an omen for what was in store for me taste-wise. I can only imagine Pikachu's so sad because two of his best friends are getting sidelined for his newest film. 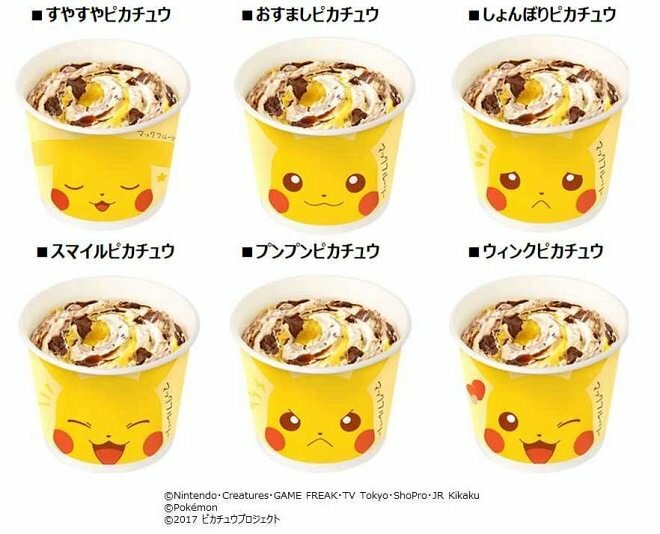 I won't lie to you intrepid readers, the Pikachu Choco-Banana McFlurry isn't the most appetizing looking frozen dessert. Put frankly, it's a goopy brown, white, and yellow mess. If you're trying to entice customers to buy your ice cream, I don't know if you want it looking like something found in the corner of a gas station restroom, but what do I know? 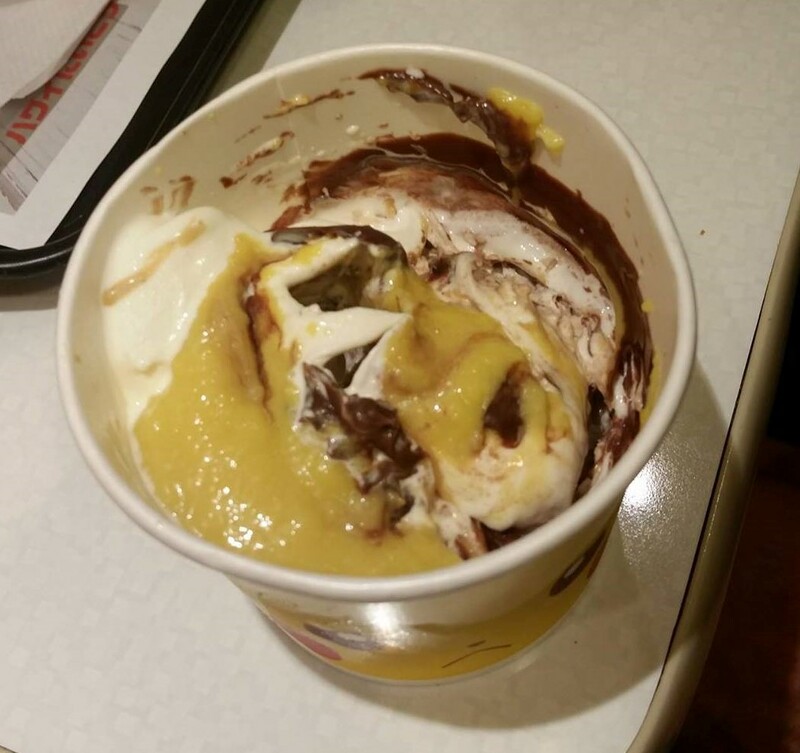 Looks more like a Pikachu Bruised Banana McFlurry to me. 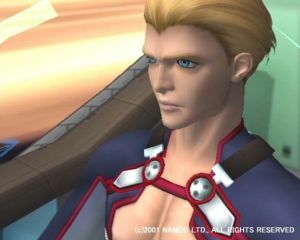 Vanilla Ice Cream: The vanilla ice cream was smooth and sweet, just like you'd expect. McDonald's vanilla ice cream is the same no matter where you go in the world it seems, as it tasted exactly as I remembered it back home. 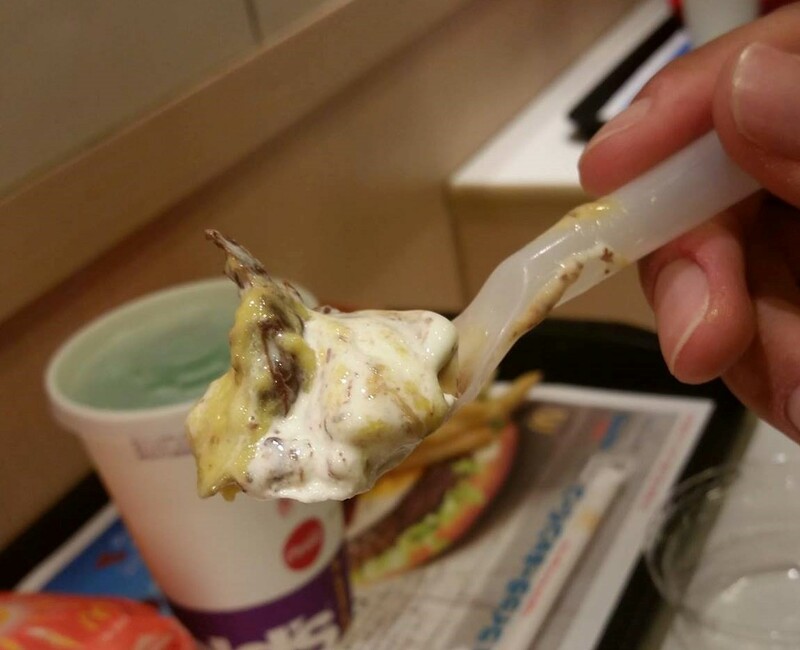 McDonald's has always produced consistently satisfying soft serve ice cream that pleases millions the Pikachu Choco-Banana McFlurry is no exception. So far, so good. Chocolate Shell: Yep, you read that right. That's not chocolate syrup in there, but rather chocolate shell. You know, that kind you pour on top of your ice cream and then wait until it solidifies? I was surprised to find this McFlurry has more in common with a frozen chocolate covered banana than it's more famous cousin, the banana split. The chocolate itself was of low quality, the type you might expect to find in your typical convience store. It had a strong chocolatey flavor, a light sweetness, and the thin chocolate melted quickly on my tongue. Easily the most powerful of the three ingredients. Banana Sauce: The banana sauce had the consistency of baby food and a very smooth texture. While mildly sweet, it was unexpectly low on banana flavor. I guess I was expecting a strong kick of sweetened banana, this being a dessert, but what I got was much more subdued, almost like it actually was just a mashed up banana. Without further delay, I took a nice big spoonful of all three. Here's comes the train! Choo-choo! Well, this was a pleasant surprise. Despite my misgivings with some elements of the ingredients seperately, all three came together to create a creamy mouthwatering combo of banana, vanilla and chocolate. The vanilla mixed so well with the banana that I could've swore I was eating banana flavored ice cream for a moment. The chocolate was a bit too strong though, pulling me away from that assessment with its contrasting flavor. Banana and vanilla are both generally light flavors, whereas chocolate usually has a a bit more power to it, and those dynamics played out here. It was overall a delicous combination. I only wish the chocolate could have melded a bit better with the other two flavors. 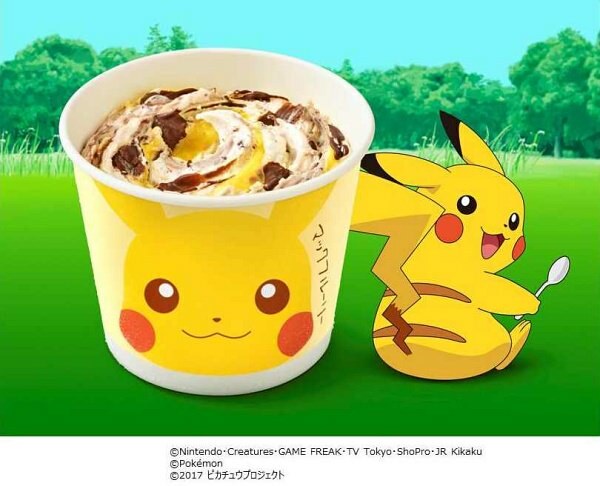 The Pikachu Choco-Banana McFlurry is a shockingly sweet summer treat that, while just a bit too strong on the chocolate side, manages to satisfy with its subtle, understated banana flavor. If you're looking for a fruity ice cream confection that's not too sweet and if you can get past its offputing appearance, look no further. Hopefully McDonalds and The Pokemon Company will consider giving this little gem of a promotion a wider release once the 20th Pokemon movie is brought to other regions. Until then, you've got until August to grab a flight to Japan to catch one for yourself.